Sid Navarro is Anchor Islands smart-mouthed boat mechanic. She has been in love with Lucas Dempsey since high school, but Lucas always had his sights set on bigger and better things and as soon as he finished school he left the island. After his father suffers a heart attack, Lucas returns to the island to look after the family business for the summer. He’s thrown together with Sid and sparks immediately fly but the women he’s attracted to are quiet, reserved…pastels, and Sid is anything but. She’s brash and in your face, she could swear a sailor under the table. Despite not being his usual type, Lucas is attracted to Sid. But she will never fit into his world and he needs to return to the mainland by the end of the summer so the best he can offer is a summer fling. What he doesn’t know is that beneath her hard shell is a vulnerable young woman and when he leaves, he will break her heart. It’s difficult to know what to say about Up to the Challenge. No matter what I say, it just won’t be enough. If I take the very best books by Jill Shalvis and Robyn Carr, wave my magic wand and somehow make them 20% better, then we are probably getting close to how good this book is. Solid gold 5 Stars! 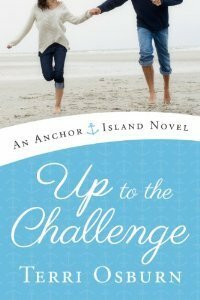 This entry was posted in Uncategorized and tagged anchor island, contemporary romance, Lucas Dempsey, Sid Navarro, Terri Osburn by setaian. Bookmark the permalink.